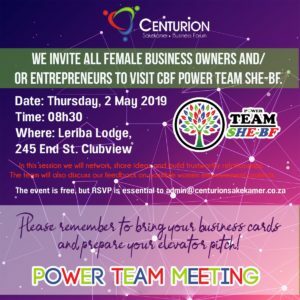 To create a warm, friendly networking platform and a dynamic presentation that transfers business knowledge, in order to support financial growth. To care for our fellow-members & facilitate competent business choices in order to produce a successful community. Members and Guests will be greeted in a warm and friendly manner. Committee members will be the “host” at a table at every networking function. Committee members will bring one visitor to every networking function. Have a 8/10 or higher evaluation. Must have literature, handouts, CDs, etc. CBF Members = 80% Entrepreneurs. (Suggestion: Can check turnover over the last 12 months before joining). We believe corporate financial growth equates to visibility. 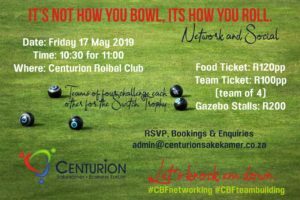 Do you believe that you’re investment with the CBF has given you the opportunity to expand your brand in Centurion? Networking: To create opportunities for personal and professional growth in a safe environment. Chamber: An NPO that focuses on: linking business people connecting business opportunities sharing business knowledge. Community: To unify people in a positive and encouraging way in order to work together for the best of the whole. Financial Growth: To establish a platform to expose our members’ products and services that will lead to an increase of their revenue. Integrity: Our motive is to have our members’ best interest at heart. Ethical: Being honest and truthful in our communication to others, friendships and business partnerships. Care: Being hospitable to make our members feel genuinely appreciated. Q: What are the 3 most important topics you would like to listen to from a Motivational Speaker? 19: Personal/business growth, 15: Marketing, 11: Financial growth. Q: What aspects of the CBF do you enjoy the most? Q: What are your top 3 expectations from the CBF?